At different points in my life, sauce love has been a downfall. For example, circa 2007-2008 when I was on the hunt for the perfect Alfredo sauce. And then started making it. You know I love me some butter. But if you put a truck load of butter and cream on white pasta, inevitably, you’ll become a truck load of butter. It’s just the way it is. 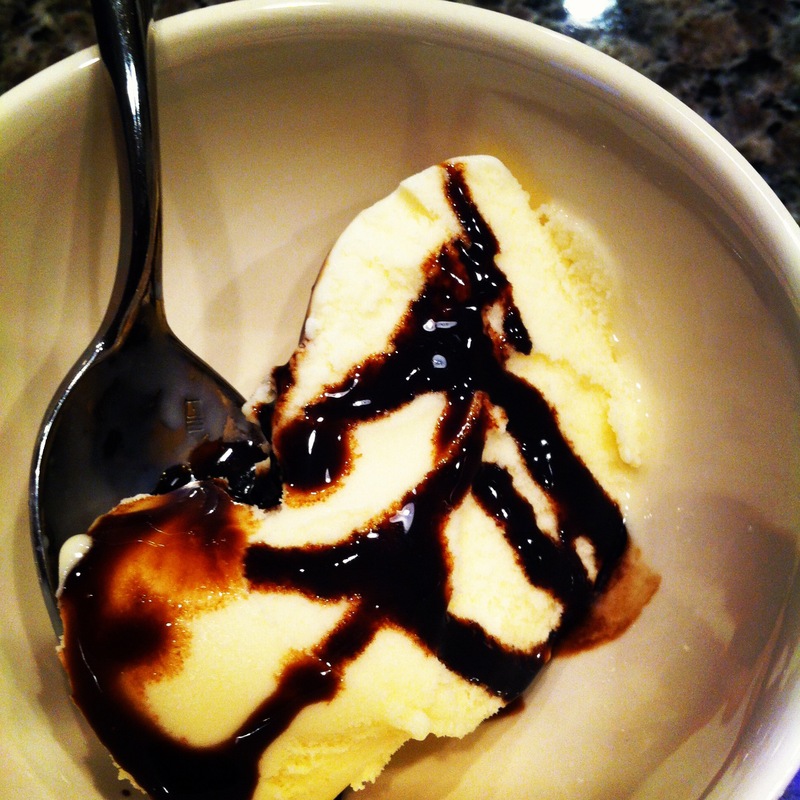 Anyway, I’ve recently discovered what a reduction of balsamic vinegar is. I’m not sure why no one told me about this. Except that now, I’m reducing bottles of vinegar daily. And loving it. 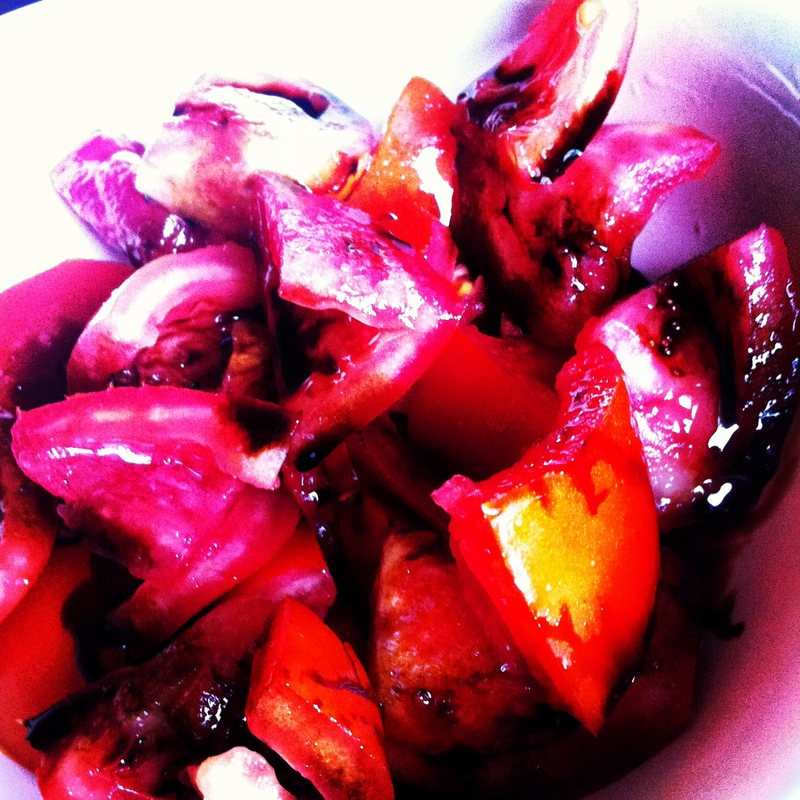 Over fresh tomato chunks… Delightful! Over LaLoo’s Snowflake goat’s milk ice cream? So, that’s one sauce I’m loving these days. The other is a sauce I’ve loved for over a decade. It’s one of the signature sauces from Angelica Kitchen in NYC, and I would probably eat a paper bag if you dipped it in this stuff. While the actual sauce in the restaurant is the best ever, this recipe does come close, and is simply delicious on steamed veggies, buckwheat noodles, brown rice… Anything really. You’ll notice that the proportions of rice vinegar, sweetener, tamari are equal. I used maple syrup in place of brown sugar and just adjusted the amount of water needed. I omitted garlic, as I’m not a huge fan of raw garlic. I did put the fresh ginger and that was delicious. Well, my friends, it is Friday. In exactly 7 days, I will leaving my only son and traveling across the country to drink wine, eat, and sleep in peace. I’m already having mini panic attacks. I know he will be fine. I know that. But suddenly the thought of being away from him for more than a few hours is extremely overwhelming! So I’m really excited + really freaked out. Ladies with kids – how was it your first time leaving your little one? Did you freak out? Hi guys! I hope your Thursday is off to a good start. We’re currently attempting morning nap #1 while the dogs are off getting pretty. I did start the day off with my glass of warm water + lemon, and had my juice about 30 minutes ago. 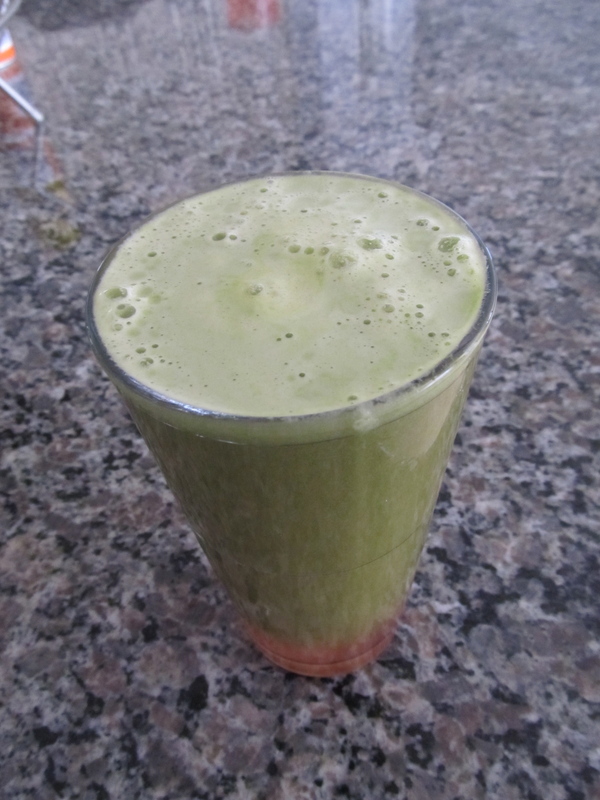 It was a refreshing blend of celery, swiss chard, apple, and lemon. I wanted to talk to you today about salad dressing, because for me it’s always been the most important part of any salad. The truth of the matter is, I’ve done some bad things to salads in my life. Take me to Whole Foods and I’ll end up with lettuce topped with every single mayonaise pasted pasta salad they have, hard boiled eggs, cheese, AND some cream-based dressing. I really love creamy dressings. And cheese. And croutons. Basically, I might as well just have the piece of pizza, because no veggies were surviving my salad dressing. I’ve tried a lot of different ways of eating salad to be healthy too. I’ve done nothing but lemon juice and stevia extract. I’ve done sliced avocado and lemon juice. I’ve tried numerous variations of olive oil + vinegar. But I have to be honest: my true dressing love is creamy! And once I realized this, I realized that this was the reason I wasn’t enjoying healthy salads for lunch anymore – I didn’t enjoy them! If it doesn’t taste good, really, what is the point? 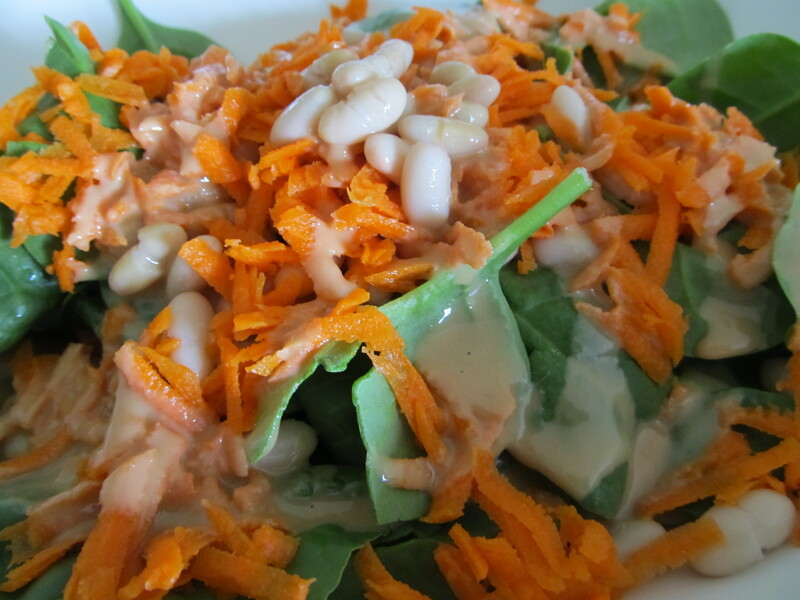 This week I’ve had a big raw salad for lunch every single day and I have loved it. Licked-the-bowl-clean loved it. They are not complicated or expensive, but they are delicious, and the secret is in the dressing. 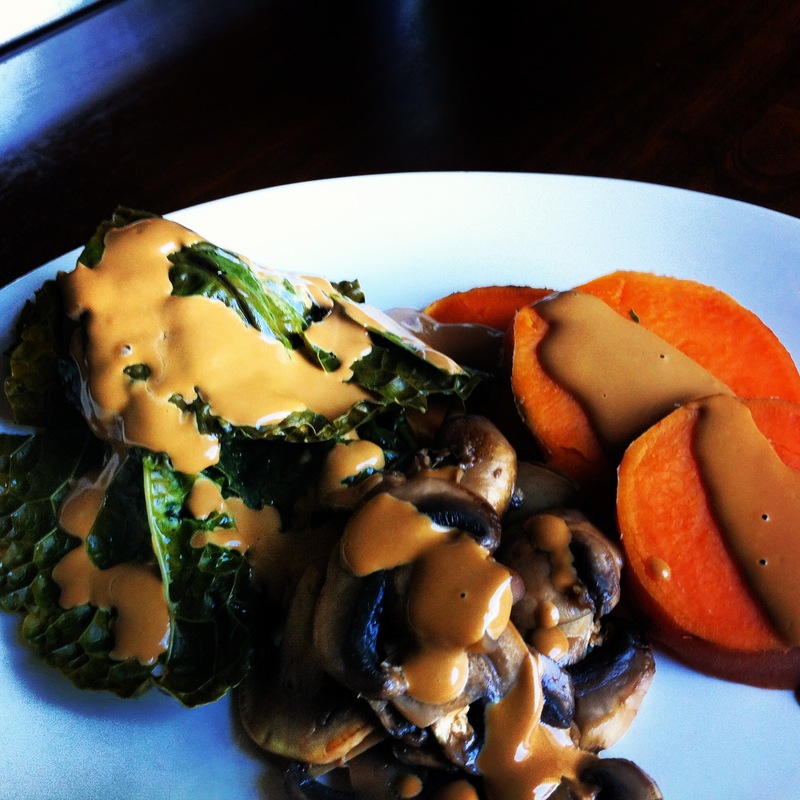 My current “go to” dressing is a simple tahini based one that I practically drench my veggies in. Combine all ingredients in a blender, food processor, magic bullet, or whisk in a bowl until creamy. This will thicken up in the fridge, you can add a few drops of hot water to loosen it up. You could add any number of spices or fresh herbs to this as well to punch it up, but I love it just as it is. This dressing is sweet, creamy, rich, savory, and just pure decadence. But it’s also good for you. Win! If you’re interested in trying some more delicious dressing ideas, check out Gena’s dressing page on her site, Choosing Raw. I am not vegan nor do I only eat raw, but I find myself running to her recipes all the time because they are so vibrant and yummy. Happy Sunday! I hope you’re all enjoying this long weekend so far. We have a wedding this afternoon, but for now, we are still chillaxing. It seems as though my hubs has gotten either a cold, or his allergies have hit him hard, so he’s been laying low. I did have an opportunity to run to the grocery store solo (a rare treat!) and decided to just go ahead and do my shopping for the week as well. One thing that I’ve always wanted to be excellent at, but have habitually sucked at is menu planning. Trips to the grocery store tend to quickly spiral out of control, despite numerous attempts at lists, iPhone apps, and stern “talking to’s” from myself to me. This kind of behavior leads to impulse buys, wasted food, and a very disorganized fridge. So, what’s a girl to do? Well, you do what any sensible person will do when they aren’t good at something: pretend you are. If you pretend hard enough, it’ll happen. Trust me. I didn’t make a list, which I decided I didn’t need because I’m just so excellent at menu planning. My brain is like a computer. I knew though, that I wanted several kale-based salads this week and plenty of juice with a celery base. I also knew that I’d be making a gallon of some tahini-based dressing to douse my veggies in. I also remembered, with my frighteningly sharp mind, that I had some veggies, a double pack of organic tofu, pork loin, fish, and chicken already purchased and either in the fridge downstairs or frozen. Once home, I wrote up this meal plan for us. 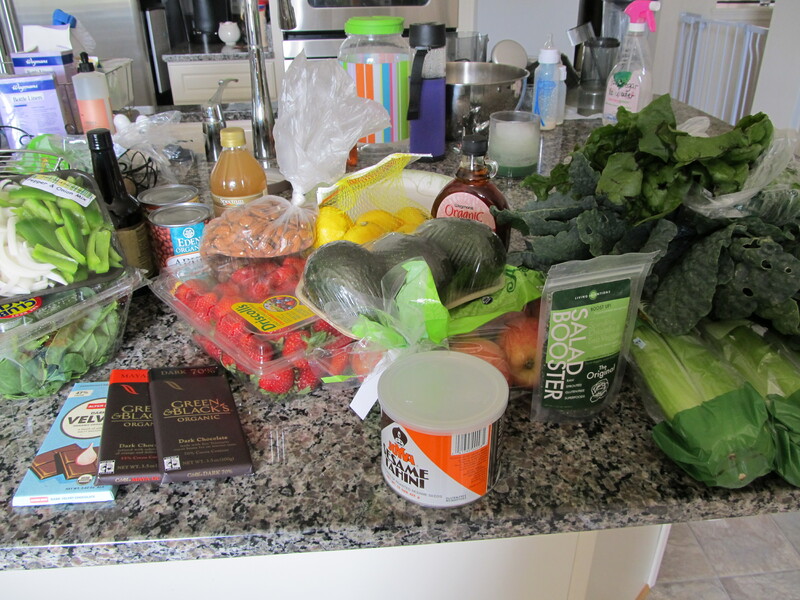 I omitted any wheat products this week, because while traveling last week I went a little bonkers. I did manage to stay away from sugar for the most part, in its obvious forms, but when you visit an amazingly delicious Indian restaurant and your dad orders every mouth-watering item on the menu, it’s just plain rude to decline… anything. Right? Right. So I’m currently rocking a very pimply face. And just in time for the wedding this afternoon. I know exactly what I’ll feel like after a week of that menu: AWESOME. And since I’m a professional menu planner, I’d expect nothing less.